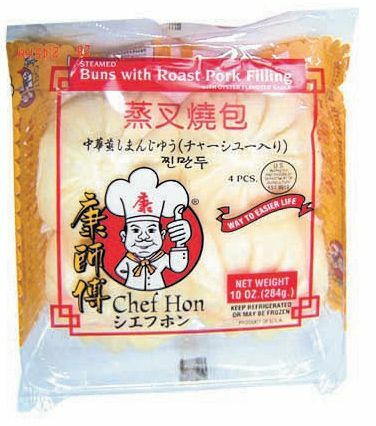 Pork, Sugar, Water, Oyster Sauce (Water, Sugar, Salt, Oyster Extractives [Oyster, Water, Salt, Monosodium Glutamate, Modified Corn Starch, Wheat Flour, Caramel Color]), Hoisin Sauce (Sugar, Water, Vinegar, Soy Bean, Salt, Wheat Flour, Garlic, Sesame Seed Oil, Chili, Spices & Certified Food Color (FD & C Red #40), Soy Bean Oil, Salt, Soy Sauce (Water, Wheat, Soy Beans, Salt, Sodium Benzoate: Less Than 1/10% of 1% as a Preservative), Wine (Water, Rice, Wheat, Salt & Caramel), Tapioca Starch, Chee Hou Sauce (Sugar, Vinegar, Soy Bean, Water, Salt, Wheat Flour, Garlic, Sesame Seed Oil, Chili, Spices & Certified Food Color [FD & C Yellow #6 & Red #40, Water, 1/10 of 1% of Benzoate of Soda]), Garlic Powder, Onion, Dark Soy Sauce (Water, Rice, Wheat, Salt, Caramel), Corn Starch, Scallion, Ginger, Monosodium Glutamate, Certified Food Color (FD & C Yellow #6 & Red #40, Water, & 1/10 of 1% of Benzoate of Soda), Sesame Seed Oil, White Pepper. Remove buns from package. Bring water to boil. Place buns in steamer and boil for 15 minutes or until internal temperature reaches 165 degrees Fahrenheit.